Compared to other programming languages, Ruby is generally readable and easier and so the folder structure is also less authoritative, though a very noteworthy observation not to miss before we go into frameworks discussion. Below is a high level illustration. I will explain below in addition to the call outs. results.html gets generated when we run cucumber with html reports on. 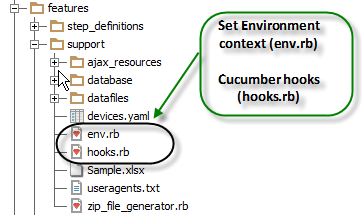 When Cucumber is run, there is a certain sequence of events that happen before the actual scenario is run. 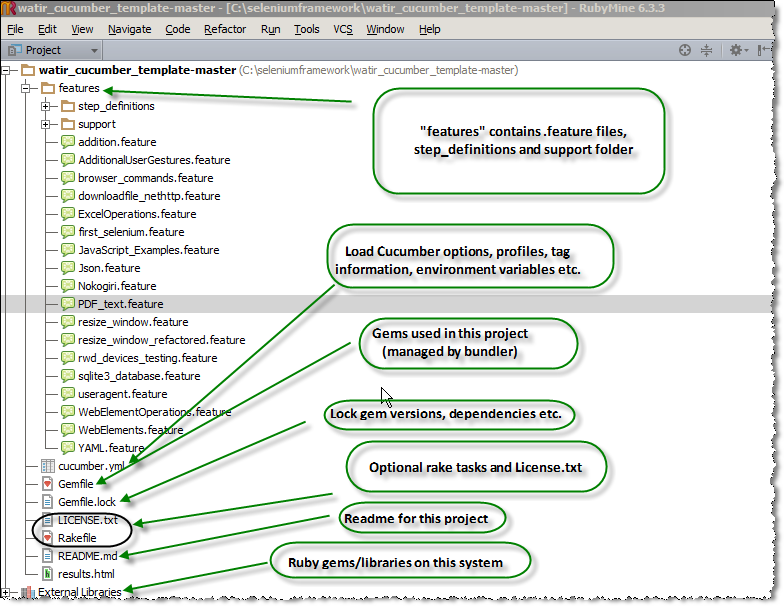 All ruby code under support folder gets loaded into the ruby runtime context. Hence we would want to load up all gems and their modules in the env.rb file as below for example. It is important to note here that we can externalize any ruby code and then include it in context, by using env.rb file. For example, I can have my ruby files in a completely different folder, however if I intend to use them, then I have to include it in env.rb. When we discuss frameworks in details,we will talk about re-usability and how we can keep ruby code in separate folder and include those modules/classes into the current project and some other cucumber project too. ENV['BROWSER'] = "chrome" if ENV['BROWSER'].nil?